The importance of the continued development of group methods as an effective psychotherapeutic tool is made more pressing by an ever-increasing awareness of the extent of emotional illness. The point that a greater number of patients can be treated through group methods is sound. However, a far more relevant argument speaks in favor of group psychotherapy: even if an adequate number of competent psychotherapists should become available for all those needing professional help—an assumption that forever will remain utopian—treatment by individual therapists or analysts could hardly provide a solution within the financial reach of the majority of patients. Most people can afford no more than the cost of one individual session per week, which is insufficient for effective treatment in most cases. The only hope, therefore, is to develop forms of intensive group psychotherapy—perhaps combined with occasional individual sessions—which will be so effective that the average patient might obtain valid psychotherapy at a cost within his means. Independent of these considerations, it must be stressed that from a purely theoretical point of view group therapy has gained a place of considerable importance by deepening, widening, and, in some areas, changing our understanding of psychological mechanisms and therapeutic processes, thereby allowing the formulation of better hypotheses regarding psychoanalytic theory and technique. No therapist—regardless how gifted and accomplished—can rightfully claim complete professional competence in this field until he has studied and practiced the art of group psychotherapy over a prolonged period. Neither will he fully comprehend his patient until he has seen him interact as a member of a therapy group. For it is in this setting that the therapist will be provided important additional clues, a broader view of behavior and personality traits, some of which may be surprising. Our desire, therefore, has been to present herein not a unified system but the diverse and challenging thinking of some of the world’s outstanding exponents of different approaches to analytic group psychotherapy. After carefully studying the publications of approximately 400 group therapists in Europe and the United States, thirty two of them were invited to describe their specific methods and points of view. The selection of manuscripts for this volume was influenced by the desire to present methods that will provide a basis for future exploration and improvement. With the exception of the “Introduction to Psychoanalytic Group Therapy,” all papers were written specifically for this volume. Each author was encouraged to structure his chapter freely and to express his individual views, regardless of the difference in his orientation from that of the editor or the other contributors. An effort was made to choose only one authoritative spokesman for each orientation, form, or special application of group psychotherapy. On the whole, these papers provide a broad view of the various methods and uses of group treatment in depth. The clinical research described is ample proof that group psychotherapy sometimes combined with occasional or regular individual sessions, can be an effective method for helping the emotionally disturbed. 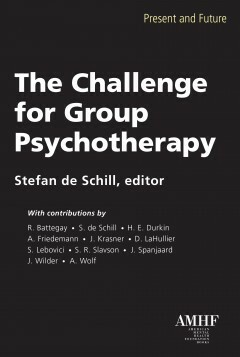 It is hoped that the theories and techniques presented will encourage therapists engaged only in individual treatment to enter the field of group psychotherapy as well as expand the knowledge of the experienced group practitioner. Published at a time when there is a proliferation of group methods, this volume will help to focus and clarify the essential components of group psychotherapy. The growth of group therapy in the United States, as in the case of psychoanalysis and psychoanalytically oriented psychotherapy, has been more rapid than in most European countries. For example, in New York City, an estimated forty percent of persons receiving psychotherapy are being treated in group settings. But while more persons are being treated in group therapy, they do not necessarily receive better professional help. Conscientious and effective treatment of patients in groups is far more demanding and complex than in individual analysis. It must be stressed that group psychotherapy should be practiced only by well-trained, skilled, and gifted psychotherapists who have received the necessary additional education in this field. Unfortunately, the expansion of group psychotherapeutic practice has not been accompanied by improved standards in the quality of professional training nor by a significant increase in suitable training facilities. For many years psychoanalysts tended to be too intellectual in their therapeutic work. In contrast, today, many group forms elicit mere expression of emotions and acting out with a concomitant neglect of psychotherapeutic working through of feelings which have been evoked. This reflects resistance on the part of the therapist toward treatment in depth. Thus, many current group procedures fall short of the required therapeutic effectiveness and some cannot even be considered therapy. The same problem exists for individual therapy but because of the aforementioned added exigencies of group therapy, we are facing here a truly critical situation. This is caused by an unsuitable system in the selection of students and by the inadequate education and training in the mental health professions. These practices prove to be self-perpetuating and are detrimental to the public welfare, a condition that appears to have taken a turn for the worse in recent years. To counteract this trend, the development of methods for more effective selection and training of group psychotherapists is a prime need. These studies and methods will better enable us to determine the type of personality most suited for such professional work, teach us how to select such persons, and ultimately provide optimal educational and training procedures.